Scotland has just suffered one of the worst losses in its history, losing 3-0 in a European qualifier to the country ranked 117th in the world. Kazakhstan had only won one of its last 20 qualifiers and is 67 places lower than Scotland in the Fifa rankings. But what exactly do we know about the country Kazakhstan? Kazakhstan is the ninth largest country in the world by land size. It has a population is 18.04 million. It's only a little bit smaller than Argentina and it's the world's biggest landlocked country (that means it has no seas or oceans along any of its borders). 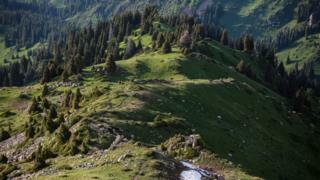 Did you know that Kazakhstan is as large as Western Europe? 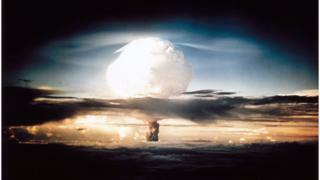 After the Cold War ended and the Soviet Union was split up into lots of different countries, Kazakhstan was given thousands of nuclear weapons. In 1995, they voluntarily gave the weapons back to Russia. Only three other countries - Belarus, South Africa and Ukraine - have done the same and got rid of their nuclear weapons. When the Soviet Union was trying to beat the USA to space, they built their first space launch facility in the Kazakh desert. 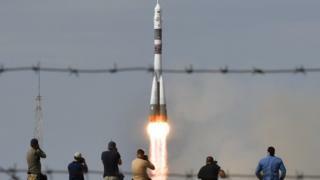 The facility, known as Baikonur, was kept secret from countries like the USA and the UK, and the first man ever in space, Yuri Gagarin, took off from there. It's still used today as launch pad for space missions, even for American astronauts (they had to tell them about it eventually) going to the International Space Station. If you ever fancy a trip to Kazakhstan you can go and pay to watch a rocket take off. It's a very important time in Kazakhstan at the moment. 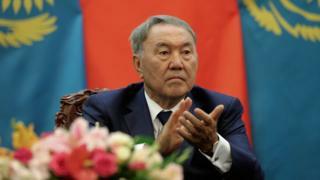 Nursultan Nazarbayev - who has been leader for the last 30 years - has just resigned as the country's president. He's the only person to lead Kazakhstan since it emerged from the collapse of the Soviet Union in the early 1990s. When the former steelworker became leader, Kazakhstan was still part of the enormous collection of countries called the Soviet Union. He was the final leader from that era still in power. He led Kazakhstan to independence in 1991 and has been in charge ever since. His time as president has been controversial because he is an authoritarian leader. He has resisted moves to make the political system democratic and he has been accused of corruption in elections. His daughter, Dariga Nazarbayeva, is one of the favourites to take over. To honour the outgoing president, Kazakhstan's capital city, Astana, has been renamed Nursultan. 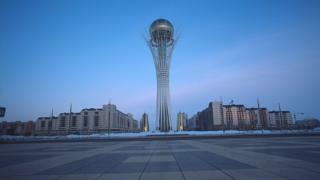 Astana, means "capital" in the Kazakh language. North Macedonia: Why does a country change its name? New Blue Peter presenter revealed!